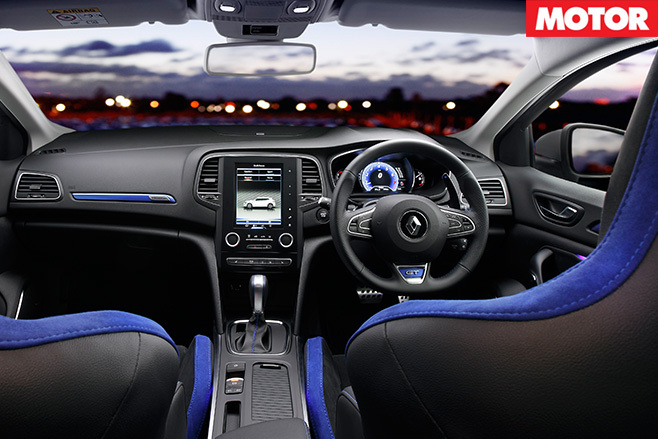 It mightn’t be familiar to many, but the term amuse-bouche comes to mind with the Renault Sport Megane GT – a pre-entree surprise, a morsel set to tantalise the tastebuds in preparation for the feast ahead. Or maybe I should just cut back on the My Kitchen Rules. 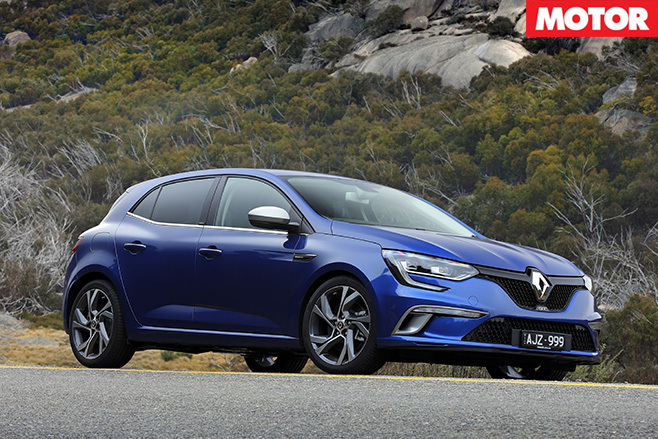 If fans had their way the new Megane RS main would be here, and yet Renault Sport has served a sample of its new five-door hatchback as a flavour of things to come. Like four-wheel steering, or 4CONTROL as it’s dubbed, and a new seven-speed dual-clutch automatic we hope rights the wrongs of the six-speed Clio RS. All in a dish served from $38,490, well below the DSG-equipped $43,490 Golf GTI that Renault hopes to poach buyers from. The Megane GT’s 1.6-litre turbo four boasts similar power to the VW’s bigger 2.0-litre, with 151kW at 6000rpm (versus 162kW), though its peak torque figure of 280Nm at 2400rpm is a long way short of the gutsier Golf’s 350Nm max. The latest Renault Sport sits low and wide, and looks great with its deep blue hero colour bouncing off the silver foglight recess, door mirrors and rear diffuser with 18-inch alloys filling the guards well.Colourful digital instruments, form-hugging sports seats – cloaked in an effervescent hue – and a leather-wrapped tiller add to the impression that this is a trim, taut little unit. That’s merely an illusion, however, because the Megane weighs a tubby 1392kg. As a result, it struggles to feel fast off the line even with launch control engaged. Renault’s 0-100km/h claim of 7.1 seconds is not only optimistic, it’s well behind MOTOR’s best of 6.37sec in the lighter Golf. Nonetheless, the engine sounds characterful through the mid-range and feels boosty and brisk. The auto is impressively intuitive, slickly rushing through its seven playing cards when in Sport-auto or using the paddles, which is a welcome change after the horrible Clio RS unit. Tight, sharp and nimble steering is another highlight aided by the 4CONTROL system that points the rear wheels in the opposite direction to the fronts (below 80km/h in Sport). The Megane GT flaunted its Sport-tuned suspension over an extremely bumpy northern NSW route, feeling poised and disciplined. Its refinement and power-down – despite the lack of a limited-slip diff – shames its 162kW manual-only Megane GT220 predecessor. This new model is now $2500 more expensive, however, and its arrival coincides with that of other rivals, the 147kW/300Nm Holden Astra RS and 150kW/265Nm Hyundai Elantra SR, both of which start from under $30K. It is an expensive starter, but this Renault is also a tasty preview before the GT flips to RS – amusing, but butch, rather than bouche.